Golden Palace Casino gives customers the chance of visiting one casino destination while not missing out on anything. Everything a player needs or could want is right here in one convenient lobby. Besides good gaming options, everything you require from the casino is also available besides the fact that you might have to go digging to find the right customer service link. 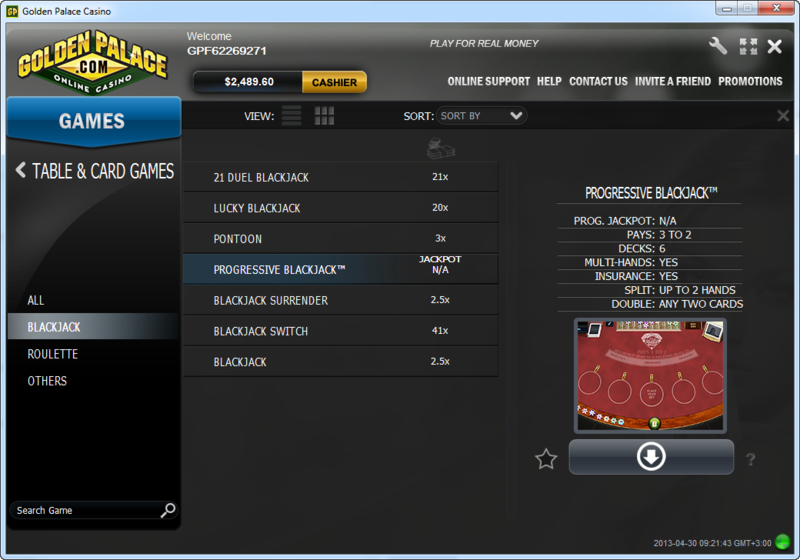 Operating through Playtech gaming software, Golden Palace Casino provides a complete online gaming experience. Though there are a couple of points that could make the casino brand itself more convenient and trustworthy for the customer, game play is high quality and shouldn’t be missed out on. Playtech has been providing online casinos with quality gaming for a long time. There are several good reasons that it was and still is one of the most widely used and commonly recognized casino software companies in the world. Golden Palace Casino also offers a live casino to customers playing with real money and a flash version of the casino to be played online with no download required. Playtech casinos like Golden Palace Casino give customers a full suite of games from all the games you might expect to find in any casino, but also including a gallery of arcade style mini-games and Playtech’s famous Marvel slots based on all of your favorite comic books. The Marvel slots are all connected to one another to form one huge progressive Marvel jackpot that just gets bigger and bigger. Comp points that pile up as you play and let you cash in for extra prizes. Golden Palace Casino offers a purely massive amount of different payment methods that cater any of your needs. With over 40 (yes, I said 40) payment options available, this is enough to ensure Golden Palace Casino is a convenient place to play. But they still go further be offering a special bonus for specific methods as mentioned above, adding huge incentive to make this your casino of choice. Golden Palace Casino seems to have put the least effort into their customer service, which isn’t bad, but could be made more accessible. If you need customer service while you’re playing in the downloaded casino software, don’t expect to get anywhere by clicking “contact us”. This only gives you a customer service email and the url to the Golden Palace Casino website. On the site, the page labeled “contact us” will also give you a phone number and email. As I did some exploring I was beginning to believe they had no live chat option, but eventually I found it, on the Cashier’s page! Everything you need is there to contact the right people for help, but you might have to go looking.